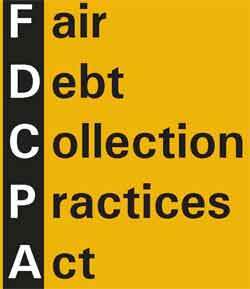 The Fair Debt Collection Practices Act (FDCPA) is part of the Consumer Protection Act and it became effective in 1978 to protect consumers from abusive debt collection actions. At The Butler Law Firm, P.A., Broward County Debt Defense Attorney Howard Butler stands up for the rights of consumers who have experienced unfair harassment by debt collectors. If a debt collector has violated the FDCPA, you can take legal action to sue the collector in court. The FDCPA addresses a range of damages that may be recovered in lawsuits that are filed against violators, including monetary damages and attorney fees. Can only contact a debtor by phone between the hours of 8:00 a.m. and 9:00 p.m. If you are being subjected to abusive or illegal creditor harassment, these circumstances will likely become worse and more complex if you do not retain proper legal representation. You should obtain strong legal guidance at your earliest convenience. The Florida Consumer Collection Practices Act (FCCPA) was created to supplement the provisions under the Federal Fair Debt Collection Practices Act. The Florida Consumer Collection Practices Act prohibits debt collectors and creditors from actions that are considered deceptive and abusive. The difference between the FDCPA and the FCCPA is that the FCCPA also covers original creditors. When debt collectors take certain actions that violate the Fair Debt Collection Practices Act, you can sue the collector in court to obtain monetary damages. Courts can also order injunctive relief, which is the termination of certain activities. If you are facing unfair practices from a debt collector, do not hesitate to consult with Broward County Bankruptcy attorney Howard Butler at The Butler Law Firm, P.A. and obtain a free case evaluation.